This humble guide attempts to compare and contrast a great sampling of microbrewed and macrobrewed beers and ales on the market, offering easy to read reviews and handy observations of a fine cross-section of more than 14,500 brews consumed and rated since 1997. Ever since Samuel Adams, Sierra Nevada and other microbreweries popped up in the ‘80s, the American marketplace has expanded, saturating distributors, liquor stores, and grocery shelves with a wide assortment of different beer and ale styles from all over the globe. Only limited imports (Heineken, Molson, Lowenbrau, Beck, etc.) were available for consumption in the United States during the ‘70s, when only limited bad to fair macrobrews (listed in the Beerscum section) ruled the country. Whereas there were over 2,000 American breweries vying for attention in 1900, the aftereffect of prohibition dropped that number to less than twenty. By 1980, there were still only sixty breweries, but thanks to President Carter, home brewing was legalized on October 14, 1978, bringing about the microbrew revolution. There are now over 6,400 breweries in the States. As better European beers and ales were allowed to surface in America, many local independent microbrewers popped up, becoming more experimental with varied recipes. Nowadays, America has no problem keeping up with, and often surpassing, international brews. While nearly impossible to review every beer-ale available on the United States and international market, we have attempted to identify every quality brewer in existence. Since tastes vary, we hope to lead consumers to their best possible choices by distinguishing between the ‘real deal’ and mere imitators without reservation. Rarely did our rating judgments wildly fluctuate. At most, there may have been a dozen beers or ales that one of us gave a 3.5 and the other a 2. We admit our tastes run towards the darker brews (stouts, porters, brown ales) more so than lighter brews (pilsners, lagers, golden ales), but being that we grew up on Budweiser, Miller, and other lackluster American macrobrews, we fully trust our fine, experienced attention to detail. Even if we may have missed some particular ‘styles’ from different brewers, some have a similar ‘vibe’ to that particular brewers rated product, using similar ingredients, yeast fermentation, and water. The apple doesn’t fall far from the tree. ‘It’s the water’ is actually a true, binding statement, as it is the most important ingredient for quality beers and ales. It should be noted that 16 and 22 ounce bottles tend to be pasteurized less than 12 ounce bottles simply because there’s more beer or ale per bottle and more yeast remains on the bottom. 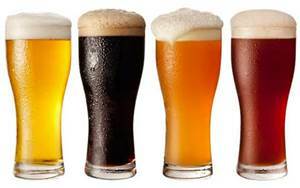 Therefore, larger bottled beers or ales will show better characteristics of each particular style. In fact, the best brews keep revealing different flavor illusions. Some aberrations in brewing quality could augment flavor factors, but not necessarily the true essence of a beer or ale. Each brewers batch is made separately so ingredients are always going to differ by even the smallest percentage. But the best way to experience the best brews is on tap, since pasteurization and processing sometimes dwindle the adjuncts, complexities, and dimensions of bottled beers. But wait, while I was compiling micro-macro brews, I decided to visit many stateside brewpubs, which sell their own unique ‘home brews’ on-site or in 1-gallon growlers-to-go. In my BEER INDEX (a thoughtfully scatterbrained travelogue), many brewpub offerings could be found. Though not yet a comprehensive listing, it will definitely help vacationing readers sort through the (sometimes) over-saturated marketplace. WE APOLOGIZE FOR ANY DISCREPANCIES. So it’s with great pleasure we present this guide to everyone looking to expand his or her horizon. As serious beer ‘enthusiasts,’ we’re convinced as of this date we’ve covered 90% or more of the semipopular and popular beers and ales currently available at any quality liquor store or grocery store at any given time in America (sans horrid processed ‘lite’ beers which deserve to perish immediately). And that’s an understatement! As this guide was getting underway in ’97, it became more difficult to find new brews to review, even though we had access to the finest distributors in the New York metropolitan area. However, by 2005, that problem was forever solved as the proliferation of brewery’s exploded exponentially. Initially, we decided the only way for us to be fair was to not visit microbreweries, which then tended to make reviewers feel obligated or emotionally involved. Besides, over the course of eight years we re-tried many brews, sometimes doubting our own initial assumptions. We also felt wiser spending money buying new beers rather than putting cash towards attending conventions since most had little to offer for the price involved (though who could resist Ale Street News’ Tavern on the Green beer tasting-dinner shindig in 2000). Nevertheless, that theory (to not visit breweries) no longer applies as all the finest microbreweries and beerpubs have an enormous stash of hard-to-find and one-off brews NEVER released in bottles or cans commercially. Has our research, which included consuming approximately sixty ounces of beer per night a few times a week, hurt our health? A recent New England Journal of Medicine study monitored several male doctors’ alcohol usage over several years and determined moderate intake of one to two drinks three or four times a week actually reduced heart attack risk, increased good cholesterol, and made blood less likely to clot. Originally, it was believed only red wine provided such positive effects. However, since beer is boiled during the brewing process, it’s safer to drink than milk and water. The only downside is the amount of sugar and calories involved. Even though we went a few beers beyond recommended ‘required’ dosage, we feel with a healthy regiment of exercise it was worth pursuing our goal. Personally, my search never stopped in the New York vicinity. During the last few years (2001 onward), I bought brews while vacationing in cities, towns, and rural areas all over America, scouring liquor stores, bars, eateries, microbrews, and delicatessens (see BEER INDEX). So drink and be merry while sorting through this guide’s mighty pile of recommendations. To anyone reading this:m These two guys, John and Al, are the absolute true authority on beer!!!!! !